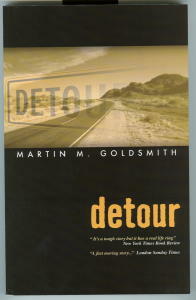 MARTIN M. GOLDSMITH, Author of DETOUR. What is known is that Martin Goldsmith was born in New York City in 1913. Over the course of his life he rarely lived in one place for long and in 1928, while still in his mid-teens, he left New York “via the thumb route” to see the rest of America. His writing career began a few years later with the publication of several short stories. By the late 1930’s Goldsmith was in Mexico, where he wrote his first book, Double Jeopardy, a crime novel published by the Macaulay Company of New York. In 1938, the author moved to Hollywood, hoping to write for f1lms. To break into the film industry he took a job as a stage hand and used the opportunity to see how films were made. During his first year in Hollywood, Goldsmith completed work on the manuscript that would become Detour. Unlike the film version of Detour, the novel features two characters who live on the fringes of the Hollywood dream – Sue Harvey, a would-be actress working as a waitress at a local drive-in and Raoul Kildare, a bit-player who plans to leave Hollywood to try his luck on Broadway. In its final form the book has a tough and hard-boiled writing style, one often identified with the likes of Dashiell Hammett and Raymond Chandler. When Detour was published by Macaulay in January of 1939, the New York Times called it “... a red hot, fast-stepping little number...” and favorably compared it to the works of James M. Cain, author of The Postman Always Rings Twice and Double Indemnity. In 1944 Goldsmith sold the film rights to Detour to the Producers Releasing Corporation (PRC), with the understanding that he would be hired to write the screenplay. The author finished writing the screenplay before the hiring of director Edgar G. Ulmer, the person most often credited with the film’s success. Operating under a tight budget and with little known actors, Ulmer shot the fIlm in less than a week, relying heavily on Goldsmith’s detailed script. 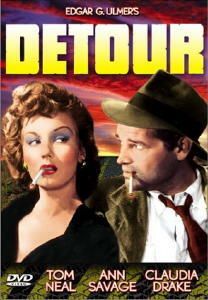 Released in 1945, the film version of Detour is recognized as a masterpiece of film noir. In 1992 the film was selected by the Library of Congress for entry into the National Film Registry. In all, Goldsmith received screen credit for work on twelve films including Dangerous Intruder, Blind Spot, Shakedown, and Hell’s Island. He wrote two other novels, Shadows at Noon, a fictional account of an enemy attack on Manhattan, published in 1943, and a comic novel, The Miraculous Fish of Domingo Gonzalez, published in 1950. In 1952 he received an Academy Award nomination for contributing the story for the crime film, The Narrow Margin. During these years he also wrote for television, turning out episodes of The Twilight Zone, Gunsmoke and Playhouse 90. Despite his success as a screenwriter, Goldsmith eventually tired of writing for films and television and in the mid 1960’s he gave it up to spend more time traveling with his wife and writing books. His last works included an unpublished autobiography and a play entitled Night Shift, which ran for 24 performances at the Labor Theater in New York in the fall of 1977. After a long period of declining health, Martin M. Goldsmith died on May 24, 1994. NOTE: This short biography of Mr. Goldsmith is also the foreword to the current reissue of Detour by O’Bryan House, Publishers LLC, the first American paperback edition of this classic crime novel. UPDATE: The book has been reviewed by Steve Lewis. You may also follow the link to a brief summary by Bill Pronzini of the author’s other two books. Bill also provides cover scans of all three in jacket. Copyright © 2005 by Richard Doody. Return to the Main Page.